Governor Sam Brownback is reconfiguring the size and scope of state government in Kansas with the help of an overwhelmingly conservative Republican legislature. He succeeded in signing some of the most conservative social and economic bills in the country. It was a contentious legislative session with some old-fashioned back-room politics, but with the Governor's faith-driven overlay. Governor Brownback moves casually and affably among public and corporate officials at a recent groundbreaking for AMC Theaters in Leawood, a suburb of Kansas City. He's talking about wind energy, for which he's backed federal tax credits. In return, he's assuming companies will invest in Kansas if their tax liability shrinks. Part salesman, part preacher, the Governor speaks to hundreds of workers gathered on the construction site of the future movie house headquarters. He says he wants his new economic proposals to revolutionize the Kansas economy. “We want to show throughout the country, we want to show it throughout the world. I want us to be a low-tax state that is pro-growth in its orientation,” he said. To help get there, the Governor signed the largest tax cut in Kansas history in June. Critics in and out of the legislature were furious. They said the exemptions on the self-employed, partnerships and certain corporations will benefit the rich, among them some of the Governor’s largest contributors, such as the billionaire Koch Brothers of Wichita. Critics claim wage-earners and the poor will be the hardest hit. Legislative analysts say the plan will rack up $2.5 billion in debt and force increasingly large cuts in services for the low-income and disabled. And it has earned the Governor a reputation as one who would like to make Kansas a model Tea Party state. But the Governor says he’s signed a lot of bills that don’t reflect Tea Party values. Alternative energy, for example, and preserving Kansas water. He says his agenda isn’t so easily defined. Later the same day the Governor switched from policy preacher to wonky academic as he presented a detailed PowerPoint on his new tax plan to a meeting of Johnson County CPAs. He talked about how collapsing tax levels and dramatically lowering rates will stop the out-migration of businesses to other lower-tax states, like Texas and Florida. The Governor’s economic agenda got mixed reviews from the women in the audience, but there was almost uniform concern about his agenda on reproductive rights. He signed some of the most restrictive abortion laws in the country, including giving more legal protection to health care providers who refuse to participate in abortions. Janet Fansk and Pamela Felton said they’d like Brownback to apply his limited government beliefs to reproductive rights the same way he does to business. “I think the government should stay out of it and let the woman decide what she wants to," Fansk said. But in Brownback’s pragmatic politics, opposition to abortion, support for prayer in the public square and creationism are not inconsistent with privatization and lower taxes. Building a coalition among social and economic conservatives was the hallmark of his 2008 presidential campaign. He talked often about an optional flat tax, personal social security accounts and his philosophy of the “whole person,” a philosophy that links his concerns for the unborn, victims of genocide in Darfur and human rights violations in North Korea. Here is Brownback as presidential candidate in 2008 talking about how he's the only Republican who represents both the fiscal and social conservative wings of the Republican party. Brownback ended his presidential campaign early on after Arkansas Governor Mike Huckabee overwhelmingly won among social conservatives. Around his home town of Parker, Kansas—population 350—he’s known simply as Sam. But his legacy of leadership is everywhere—on the walls of the local high school and the pages of the 1974 yearbook. He was quarterback, student council president, state chairman of the Future Farmers of America. He looks much the same today as he did back then, with his squareish head of bushy, brown hair and the same confident smile of a man with plans. Tim Wiess, who’s been high school principal for only five years, said he knows Brownback by reputation as a hard worker and leader in the school. Brownback’s ambition paid off. 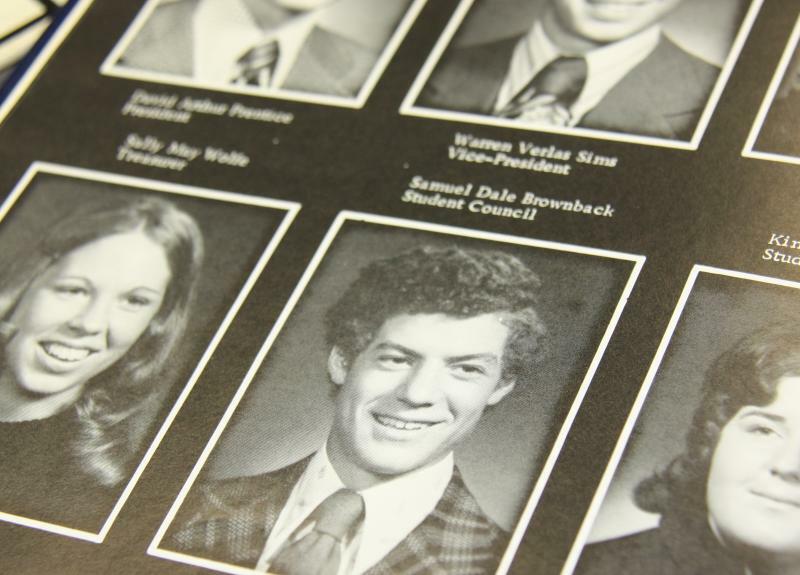 He went on to become Kansas Secretary of Agriculture at 30, then a U.S. Congressman. Within two years he bucked the Republican establishment and won Bob Dole’s Senate seat when Dole ran for President. Marty McDougal is the librarian at the new local library and minister of the Methodist church where Sam’s parents still go. She remembers when Brownback came back for the library opening and embraced her sister-in-law, Nina, who has Cerebral Palsy. McDougal pointed out that Nina couldn’t do anything for Brownback’s political career. His spiritual journey led him to a political ministry in Washington known as The Fellowship or Family, a group home with fellow evangelicals known known as “C Street” and baptism into the Catholic Church by the conservative institution Opus Dei. Classmate Cheri Dunlop says it’s all part of Sam, and he makes the people of Parker, Kansas proud. What’s next for Governor Brownback is an open question. Observers say if there’s a Democratic administration after 2012, there’s a strong possibility he’ll run again for President. The Governor isn’t tipping his hand. For more details about the tax law Brownback signed, here’s a story from the Wichita Business Journal.